She was desperate to have a child ... until she was impregnated with THE UNBORN. A young wife (Brooke Adams, Invasion Of The Body Snatchers) suspects that a mysterious doctor (James Karen, The Return Of The Living Dead, Poltergeist) has inseminated her with mutated sperm in an attempt to create a super-human fetus. Unfortunately, there are extreme side-effects. More frightening than Rosemary's Baby, this chiller features early film roles in the careers of Lisa Kudrow and Kathy Griffin. 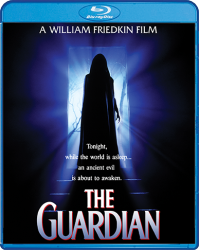 “It’s stylish and a little smarter than you might expect but it also goes for the gusto in the ways a horror fan wants… The new 2K scan of this title does well by the film’s moody, soft-lit look and the lossless 2.0 stereo track gets the job done nicely.” – Don Guarisco, Schlockmania!